Each area and aspect of our parish church has history behind it. Craftsmanship, dedication from parishioners, and historical features are just some of the things you can learn about below. 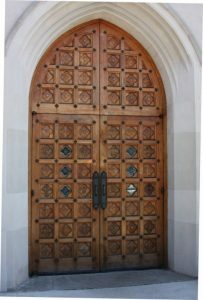 The front and side front doors, installed in 1989, were handmade of black walnut by parishioner Tom Valent and weigh about 800 pounds each. The carvings represent Saint Matthew (bull), Saint Mark (angel), Saint John (eagle), the Trinity (eye, lamb, dove), Eucharist (grapes, wheat), Alpha and Omega (A and W), baptism (seashell), and marriage (rings). The aisles and most of the sanctuary (now carpeted) have polished, terrazzo floors. The terrazzo floors consist of marble, quartz, granite and glass to create a floor with a sparkle and shine. 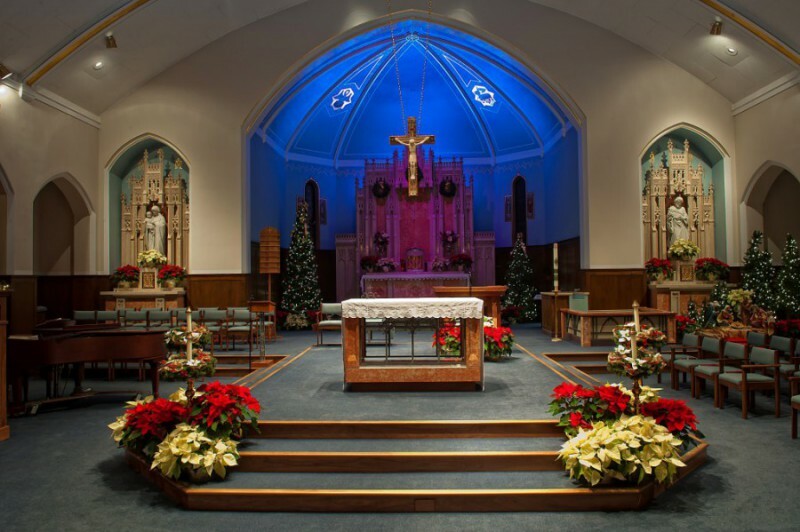 The carpet allows our singing voices to ring clearer, the ability to preserve the terrazzo floors, and give the parish an updated (and warmer) feel. The stained glass windows in the main body of the church, eight on each side, begin with Our Lady and Saint Dominic and the giving of the rosary. The windows following represent the fifteen mysteries of the rosary. The windows at the front of the church, four on each side, represent Ireland, Saint Brigid, and Saint Patrick. Those in the former choir loft represent Saint Cecilia and Saint Gregory, the patron saints of music. The two smaller windows on either side of the high altar depict six of the seven sacraments with the seventh being represented by the Tabernacle. The original church organ was purchased from the old Frolic Theater. It was replaced in 1993, by a parishioner. The Berghaus organ, installed in December 1994, was designed by Leonard Berghaus and used for Christmas liturgies in 1994. It consists of two manual divisions and pedal, 24 stops with 23 ranks, prepared for 28. 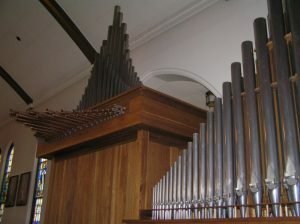 The organ is entirely freestanding with a horizontal Trompete. The casework is made of select American walnut; the manual and pedal keyboard have maple naturals and rosewood sharps. The high altar, now serving as a tabernacle for the reserved Eucharist, and the two side altars, now serving as shrines for Mary, the Mother of Jesus, and for Saint Joseph,are of ivory tone Botticino marble, with panels of Rosa Corallo marble and platforms of Verdi Alpi marble. The main altar, constructed after the Second Vatican Council, is made of marble and Dowmetal taken from the former communion rail. The Dowmetal was also used for the lecterns and the presider’s chair. The cross is of Chiampo onyx edged with borders of hand wrought bronze and the corpus is of Carrarra marble. 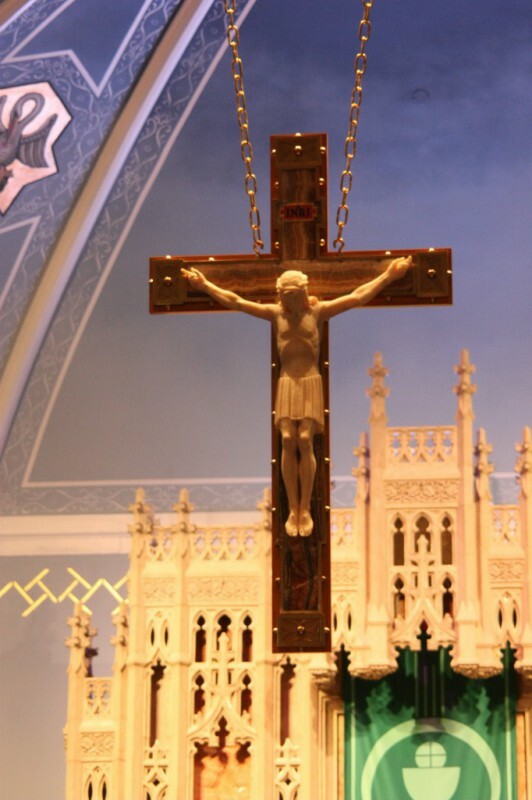 The hanging cross was originally attached to the high altar. 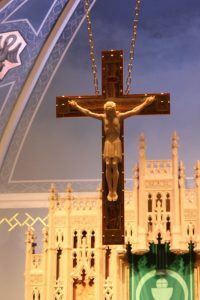 The parish processional cross shows the risen Christ and was carved by Tom Valent.